Would you like your kids to listen without having to nag, remind or yell? Sign up for the FREE webinar from Positive Parenting Solutions that we are offering. Come join me for a night filled with great tips! 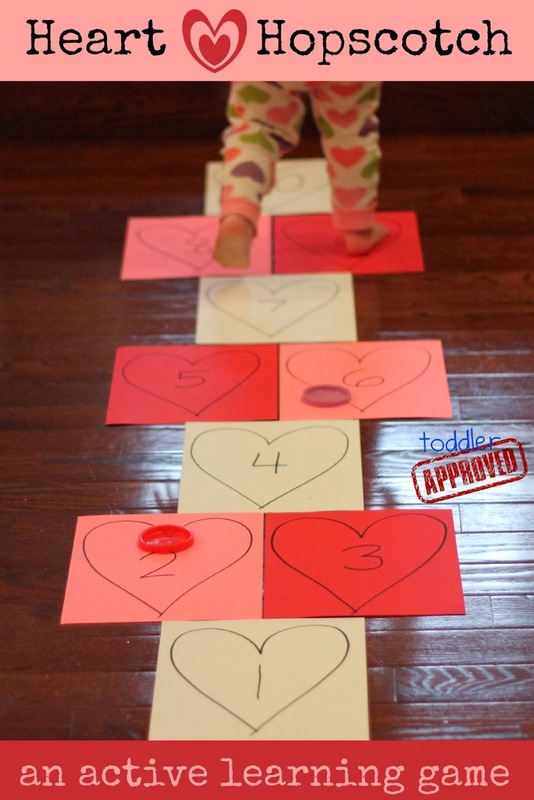 Heart hopscotch is an indoor learning game that we've been playing for awhile and it is perfect for this time of year. Hopscotch is pretty easy to play and you can teach kids all sorts of skills without them even realizing they are learning. For this version of hopscotch all we needed was colored cardstock, markers, painters tape, and some lids. We made our game by drawing hearts onto cardstock, adding numbers, and then taping the paper to the floor with painter's tape. We tossed plastic playdough lids instead of rocks. There are a lot of different versions of hopscotch you can play... we just made up our own and practiced identifying and saying the names of the numbers while my kids were hopping. My daughter just had fun jumping from number to number and saying the number names while my son played a little more strategically and tried to jump over the number that had a lid on it. Do you have any other favorite active indoor learning games? We are sharing several in this week's Toddler Approved Weekly newsletter. It's been rainy in Seattle so the kids and I have been playing indoors a lot these days. I'm super excited to try out this easy prep, active learn activity with them. Thanks Kristina!! Thanks so much for the comment! If you do it, take a picture and send it to me. We loved this one! This is such a great idea for body position - hope you don't mind but I have featured it on my blog.